At 6 years old, Molly has a lot on her plate. With many medical concerns that make even the simplest of tasks difficult, Molly is as brave as they come. This past week, Molly’s uncle Joel and new aunt Caitlyn MacQueen made an incredible gift to the Cape Breton Regional Hospital Foundation in her honour. Caitlyn and Joel, who are living in Alberta, decided that in lieu of wedding favours, they would make a $500 gift to pediatrics, where Molly spends significant time for her treatments and often ends up unexpectedly. Although they live away, the Cape Breton Regional Hospital is very important to the couple. The newly engaged couple’s family decided that they would match the gift, making it $1,000 donated to pediatrics. It was what came next that shocked Caitlyn and Joel and brought Molly’s mother, Stephanie, to tears on her brother’s wedding day. The guests of the wedding decided that $1,000 was not enough and chipped in an additional $5,000 making the total $6,000 that will help children all across Cape Breton. The impact of a kind gesture, matched by family and friends, shows exactly the kind of people Caitlyn and Joel MacQueen are. 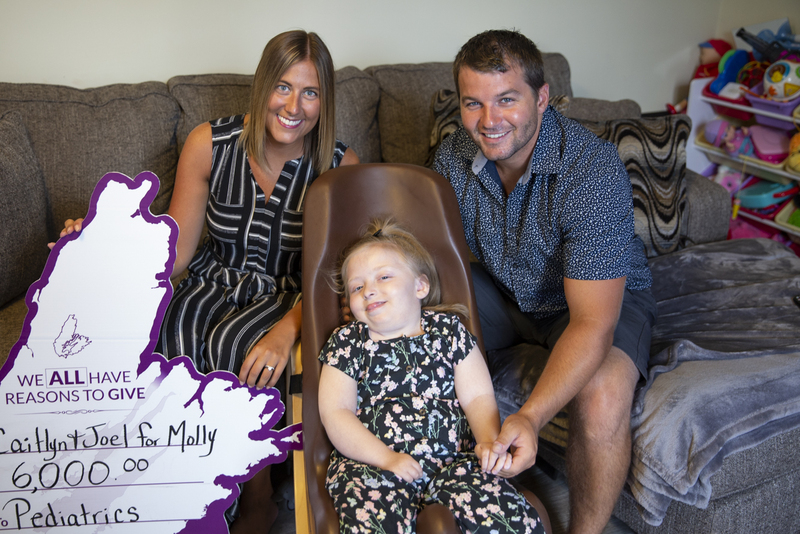 It shows how the love for their niece, Molly will in turn, help countless other children facing tough medical battles right here in Cape Breton. Thank you Caitlyn and Joel MacQueen for your wonderful generosity. Thank you to all your guests for stepping up and showing the world that Molly will make her mark on this world. Your kindness is truly heartwarming.